1. Belfast Giants (NON-MOVER) – With six more points in the bag after three wins out of three in Scotland, their position on top of these rankings was never in doubt. They’re on a roll right now, but with two away games coming, it’s a stern test of where they are. 2. 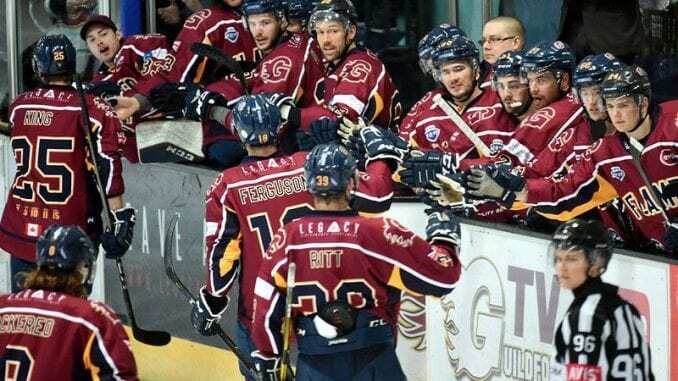 Guildford Flames (UP from 4) – Another two wins for Guildford Flames keeps the run of form going that’s making them hard to beat right now. Victories in the league and the Challenge Cup over Milton Keynes Lightning is making a lot of people smile in Surrey right now. 3. Fife Flyers (DOWN from 2) – Only the one win in three this weekend, but the character they showed in getting it on Sunday at Coventry is enough to keep them in the top three. They’re still worth watching for at the top of the table though. 4. Cardiff Devils (DOWN from 3) – A no-point weekend is a rarity in Cardiff these days, but they did get a big two points in Glasgow through the week so they got something out of the last seven days. It was a setback, but they should return as strong as ever. 5. Coventry Blaze (UP from 6) – Coventry Blaze got a massive result on Saturday, in a 6-4 success at Cardiff, which gave them a huge boost. Add to that the point they picked up against Fife on Sunday so three points out of four is not a bad return for Blaze this week. 6. Sheffield Steelers (UP from 8) – The turnaround is well and truly on for the Steelers with a 4-0 shutout win over Dundee Stars on Saturday to add to Wednesday’s overtime success over Coventry. It’s now four straight home wins and the mood is better now. 7. Nottingham Panthers (NON-MOVER) – It’s been a frustrating time for the Panthers of late, so to see them pick up a big home win over Cardiff Devils will serve them well in games going forward. Still have some work to do to get higher than where they are here. 8. Glasgow Clan (DOWN from 5) – Their run of home games continues, but sadly, no points to show for their efforts this week, losing narrowly to Cardiff on Wednesday then a more comfortable win for Belfast on Saturday, which is why Clan is down this week. 9. Manchester Storm (UP from 10) – A great win over Fife Flyers on Saturday made up for Friday’s shutout Challenge Cup loss to Nottingham Panthers. Consistency has been an issue, but beating the Flyers was a good one for them to get. 10. Dundee Stars (DOWN from 9) – Down one place for the Stars after a shutout loss at Sheffield then a home loss to Belfast, leaving Dundee back to square one after the joy of winning over MK Lightning last week. The frown was back from Pacha sadly. 11. Milton Keynes Lightning (NON-MOVER) – Now five without victory for Doug McKay’s side and only one win in their last nine, which is why they remain at the bottom of the pile here. Some big results needed going forward or this season could be a drag for them.